Hanoi (VNA) – Prime Minister Nguyen Xuan Phuc hosted a reception in Hanoi on March 25 for Alfred Kelly, CEO of Visa – the global payment technology company that looks to enable consumers, businesses, banks, and governments in using digital currency. 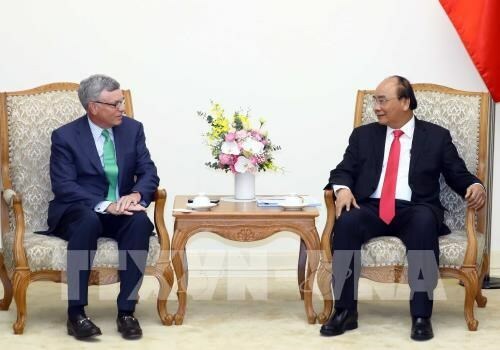 PM Phuc appreciated the US company’s presence in Vietnam over the last two decades, as well as its close coordination with the State Bank of Vietnam (SBV) and other Vietnamese partners. The Vietnamese Government completely backs the cooperation between Visa and its Vietnamese partners for mutual benefit, he affirmed, hoping that the company continues helping to ensure security and safety for e-payments in the country. He also conveyed his hope to receive Visa’s support for the building of the digital economy, e-government services, and smart cities in Vietnam. He asked the company to work with Vietnam’s relevant offices to reach a consensus on an e-payment system this year. For his part, Kelly pledged to cooperate with the Vietnamese Government, the SBV, and the National Payment Corporation of Vietnam (NAPAS) to set forth effective measures to serve Vietnamese people. He proposed both sides coordinate to strengthen security in e-transactions as Visa has experience in this field. He shared with his host that his company will organise a workshop on measures to ensure security in financial transactions in Vietnam within this week.